Simply Banh Mi. We got Halal, Vegan, and Gluten Free options too! JOHN & DIANA & SIMPLY BANH MI!!! GOOGLE, GET BANH MI PHO ME. 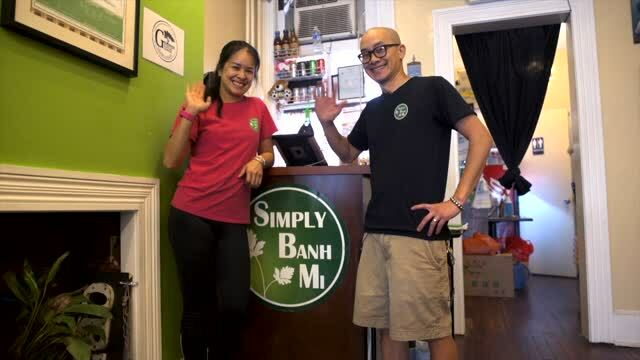 welcome to SIMPLYBANHMI! dc's best vietnamese food with admittedly dc's crappiest website. you won't find a fancy souless kiosk here to take your order. there's no modern industrial influence in our decor. our serving-ware isn't handcrafted and eclectic. we're not about design... obvs. we're a brother (john) and sister (diana) duo "duo'ing" our best to bring our mother's recipes to the masses! we deal in good eats, not so much in the interwebs, marketing, design or anything else polished. anyhoo, great food. great service. we're working on the rest. hopefully we can make a living at this... looking at you web visitor! when we first opened we were a tiny hole in the ground basement dive with a "lovable" staff, surprisingly good banh mi, super reasonable pricing, and obsessive attention to service. now we occupy the main floor with room for 22 guests. our menu has grown to include pho, rice, noodle and salad bowls. the staff are still the same down to earth kids and the food is still top notch. prices remain super reasonable. check the YELPS, playa. just the good ones, though, mmmkay? whoa wait, did we mention we have vegan, gluten free, and halal options? we do. what?! true story. bread is a limited commodity at simplybanhmi. once it's gone, it's gone for the day. if you are coming in for sandwiches, call ahead. we'll be glad to set aside some baguettes for you! do us a solid. come in, eat, relax, enjoy and help us pay the bills so that we may honor our beloved mother... ANNNND her ever "helpful" criticisms of us. mama tran is the author of two cookbooks, so we're kinda delicious by proxy. thanks mom! mom want's you to know that signed copies are available here for 30 bucks. for 40 bucks she won't talk your ear off about it. nah mean? oooor you could just come in, eat, and peruse the books at your leisure. free with every purchase, smile or high five.